Happy Turkey Day!! What’s more appropriate to post on Thanksgiving than a great roast turkey recipe that can’t be beat?! When we were planning the Feast of St. Andrew’s based on Scappi, I was very excited to see that thanks to some New World additions, we had new protein choices available to us for the feast. Our St. Andrew’s event is almost always held in November, as our Baronial Anniversary is then and it’s our biggest event of the year. What’s cheap and easily accessible in November? TURKEY!! Scappi wrote about “Indian fowl” which we know today as the turkey of North America. 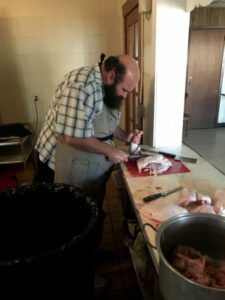 We debated back and forth and eventually landed on the idea of parting out the turkeys and roasting the parts separately. This also meant that we could customize the timing for each part of the birds – so, separate trays of wings, breasts, legs and thighs. It’s not as classic a presentation as a whole roasted turkey, but each part would be cooked perfectly to the right temperature. We needed 11 tables of 8 people, so 6 whole turkeys meant we could give each table a half of an average 16lb whole roasted turkey and have 1 half a bird leftover just in case of disaster. (*ALWAYS have some extra just in case of whatever might happen…). 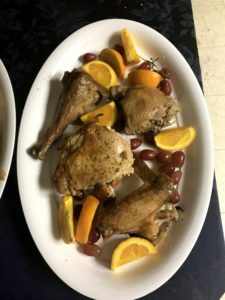 We tested out the recipe with the bird whole in Monkey’s oven at home so this recipe is for the whole bird, but we very easily adapted it to separated birds by putting the aromatics in the tray under the meat. I found whole fennel seeds in the market when I went shopping for the feast so I used my carefully cleaned out coffee grinder to pulverize the seeds before sprinkling them on the turkey. Sprinkle Turkey inside and out with salt, pepper and ground fennel. Roast at 450°F for 30 minutes and then drop the oven temperature to 350°F and cook until breast reads 165°F. Greetings and welcome to Eat Kingdom! I registered this domain nearly 2 years ago now and I’m finally starting to update it. I am Lady Vetra trys Kaukoles, and I live in the Barony of An Dubhaigeainn in the East Kingdom of the SCA. I’ve been in the Society since 1999, but I’ve only really taken up cooking since May 2014. For the past 10 months, I have been working and conspiring with Lady Monkey Makgee to recreate and execute a feast for our Baronial Anniversary, held annually in November. We really wanted to go all out to up the level of feasting in our local area. The event was Italian themed, and we chose “The Opera of Bartolomeo Scappi” published in 1570 as our source material. We specifically used the Terence Scully translation, released on Amazon in January 2011. Kind of as an afterthought when we were developing the menu, we decided to include a salad with the first course, to get things going. It turns out, actually, that Scappi did not include any recipes in his source material for what we consider a green salad! He has a few recipes that make it clear that “salad” means “preserved in oil and an acid” (I think that’s an explicit footnote by the translator, actually). The recipes that Scappi does include for “salad” are mainly fish-based and we did not want to serve fish salad as a starter (for various reasons). We were crunched for time as we left this for last, thinking it would be the easy part, so we were ready to lower our expectations when it came to absolute historicity. 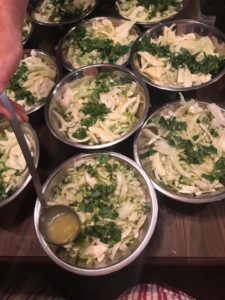 We were figuring out what to do about a week before the actual Event, and drinking wine and I think it was Monkey who came up with the great idea of a fennel salad. It sounded so fresh and amazing we HAD to do it! Fennel surely existed in period, and we already had the definition of a salad, and it was in season, so we were off! And that’s how I got All The Fennel in the Township sent to my house via PeaPod delivery service on a dark, Wednesday night in November. I ordered 24 heads; they delivered 20 with their regrets. The following day was our Baronial meeting, so we bundled up all the fennel in a human body sized garbage bag and I took the fennel for a ride to the library. Lady Monkey transferred it to her car and then on Friday, she cleaned, and used the food processor of DOOM to slice it all up and package it so it would stay fresh. On the day of the event, I put my best saucier, Rigel, on the job of creating The Dressing. We also happened to have a bunch of parsley left over (I overbought at Restaurant Depot). The best part of the salad was that it was very lightly dressed, in a lemon juice, lemon zest, olive oil and white balsamic vinegar dressing, with (I believe) a bit of fresh chopped garlic and some salt and pepper. It was dressed just a moment before going out the door and people RAVED about it. I have never seen people totally finish a bowl of salad at a feast like that before, nor have I seen them bag it up and take it home!